The post office is centrally located and easily reached from the bike paths. Follow Periwinkle until it ends at Tarpon Bay Road. Right on Tarpon Bay Road, and the Post Office is on the left. Or, from the west, follow West Gulf or San-Cap to Tarpon Bay Road, and look for the Post Office just north of Periwinkle. 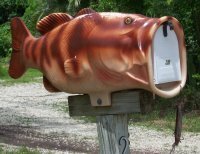 No, Captiva captives don't have to go all the way to Sanibel to buy stamps! Follow Captiva Drive, the main road through the main section of Captiva.